A little hot here today At the Fence, so we are putting off volleyball until a little later this evening. We are hoping to get a light out there so we can play after dark, when it is cooler. I just keep thinking fall! Anyway on to this new product! I love this one! Especially for science class! Be sure my home-schooling neighbors to pay attention to this one. It is a MicroPro 48 piece Microscope Set ($39.99). It is recommended for ages 8+ or 3rd grade up. 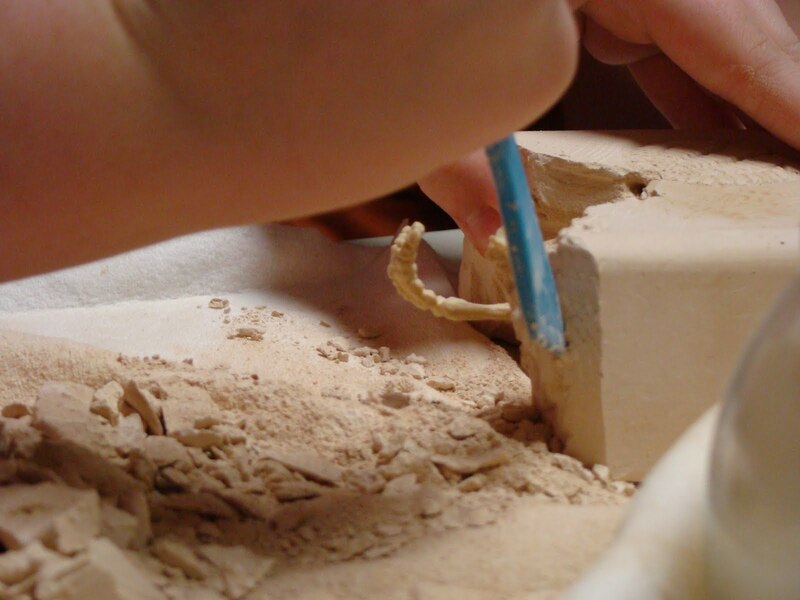 There are sharp edges for cutting on the scalpel, so keep this away from young children. Once again from Educational Insights! And an Instruction and Activity Guide. What home-schooling mom couldn't use one of these. Or perhaps your child has an interest in science experiments and study. My 10 year old has already asked if she personally can have this one. 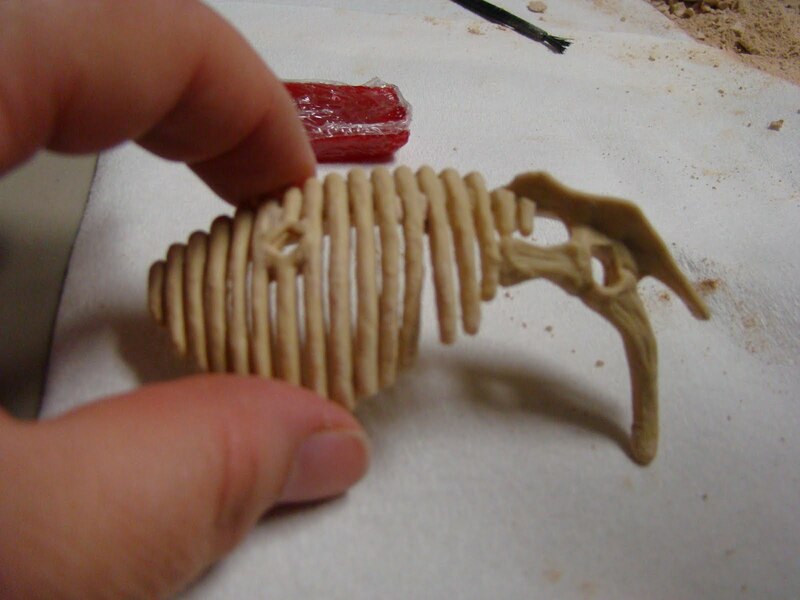 And then again maybe your child could use this for a science project this year. There are many uses for a microscope like this. The MicroPro microscope is very well made. You do need 2 AA batteries for the light in the base. The microscope comes with a rotating 3 lens turret design with 50x, 100x, 150x, 300x, and 600x magnifications. There is a rotating mirror/viewing light. 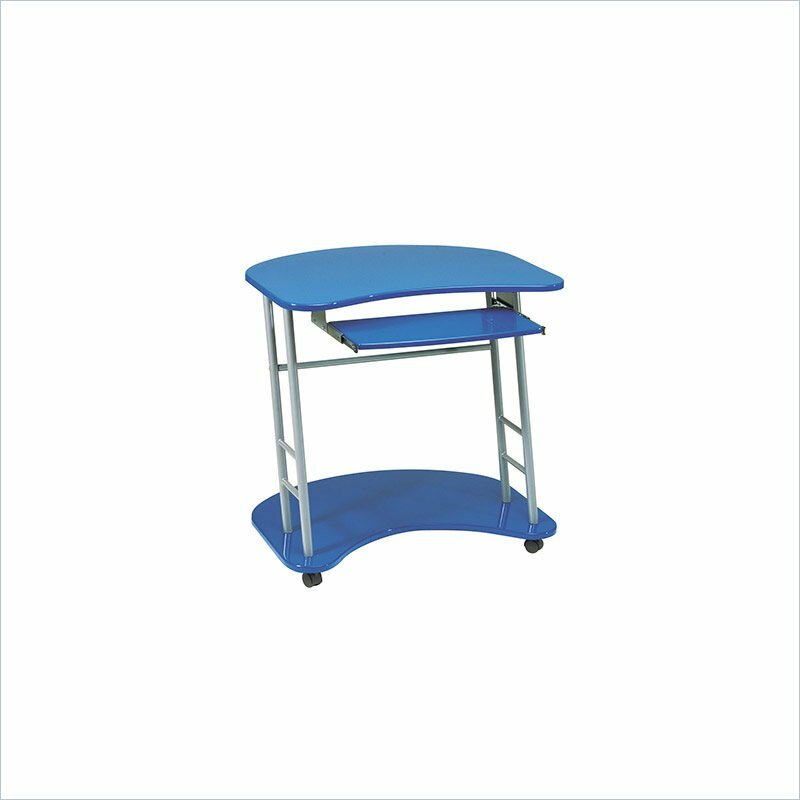 It tilts for easy viewing and has a wide stable base. Using this microscope your child can investigate pond water, view salt crystals, look at butterfly wings, etc. The Instruction /Activity Guide will teach them proper care and use of the microscope, along with giving suggestions for experiments. Each Project has an area for recording notes. Educational Insights has done it again in choosing a quality product to make available through their website. I am slowly building up more of my home-school games, activities, and products through Educational Insights. If you have never visited their website you need to take some time to browse through what they have available. It is definitely worth your time. One neighbor will win a MicroPro Microscope set in this giveaway! Disclosure: I received no monetary compensation for this post. I received the MicroPro Microscope set for this review. All quotes are taken from the Educational Insight website or email. All thoughts and opinions are mine. We Could Use More Desks! 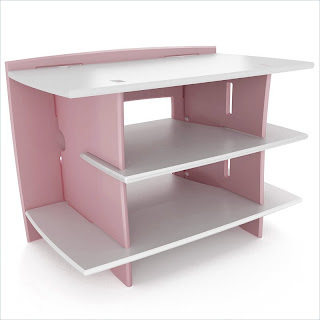 I found a really girly looking gaming computer desk that would look great in my daughter's new pink and purple room! It is called the Legare Select No Tools Assembly Kids Wood Gaming Stand. Wouldn't that look nice in a pink and purple bedroom?! I think so! It would be great to have some portable desks in the home for our family. My husband could really use one so that he could wheel it from our bedroom out into the living room, etc. Then we wouldn't have to find his computer since he sat it at the dining room table and we have to find out where he put it last. The Office Star Kool Kolor Metal Computer Desk in Blue would be perfect for him! It wouldn't be too small yet it would be big enough for him to have plenty of room. Then his computer would also be easy to keep track of! I also found a Safco desk that would be great for us. It is called the Safco Metal Folding Computer Table in Gray. 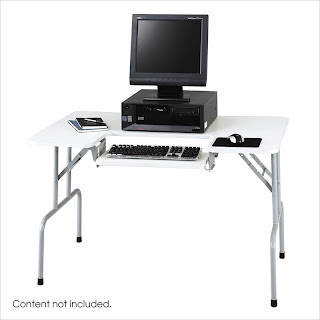 We travel alot so this would be nice to bring along with us for when we need a table for the computer, projector, etc. And the nice things is that it folds up! How convenient. Ok, I have to be upfront and honest about this. My family would definitely be one of the families in the statistics that state, "70% of people with kids under 18 say that they would be in serious trouble if something happened to the primary breadwinner. And half of Americans say they are under-insured. That is 58 million Americans that do not have enough insurance. And with today's economy I don't see that improving. In our family we have started savings accounts for each of the children. Even $5 to $10 a month per child over 18 years will eventually add up. In our family you are looking at 8 children hence the $5 or $10. With less children you could start out with more. My husband is presently looking into health insurance. Thus far the Lord has really blessed us with a healthy family, but with both of us getting older, and I was recently diagnosed with diabetes, he believes health insurance would be a good option. Just seeing the medical bills coming in from my stay in the hospital the end of May tells me health insurance would have been a major benefit. Experts claim that you should insure 5-10 times your income. Sound like a lot? Not when you start considering a house payment, auto payment (if you have one), day to day living expenses, hospital and funeral costs, the list goes on and on. Here's a little tidbit: Salary.com estimates the average stay at home mom would earn $117,867 per year if she were paid for all the work she does. Just take a minute to think about that, housecleaning, cooking, child care, accountant, nurse, teacher, etc. Can you think of a few? What about college expenses? Have you thought about that and considered a college fund? Now here I will deviate a little, none of my daughters will be attending college. They may take courses online or through the mail, but we believe that they are to stay at home. The boys on the other hand might need college depending on the field they choose. Personally at this point they are each considering working for someone we know and learning a trade, but still it could happen. My one son would like to learn to fly a plane, that will cost money, so we need to start preparing for that now. Are you feeling a little overwhelmed? Did you know that your local Allstate agent is there to help you with planning like this? They can help you plan for your future. They have been doing this for over 50 years. Giada De Laurentiis and Target! I don't know about your family, but mine loves pasta! I personally do not eat pasta now due to my diet, but the family was able to enjoy some Giada products from Target. These were really good! I received the Organic Galletti Enriched Macaroni Product, Marinara with Artichokes Pasta Sauce, Black Olive Tapenade, and Herb and Lemon Dipping Oil. Talk about a nice meal! We love to try different types of pasta anyway, so the Galletti was nice. Sort of ruffled along one edge. The sauce, according to my family was super. Very flavorful. I don't think anyone really cared for the Black Olive Tapenade, but not many in my family even like black olives. The Lemon and Herb DIpping Oil on the other hand was a great success! We knew we would like it just by the smell when you opened the bottle. Perfect for dipping warm Italian Bread. Hmmmmm! I definitely recommend these products to my neighbors here At the Fence. Yes, even the Black Olive Tapenade if you like black olives. Giada is an award winning cook and popular culinary-world personality. Target also carries some of her kitchen gear. You should be able to find each of these products at your local Target store. I am sure we will be looking into buying more! Disclosure: I received no monetary compensation for this post. I did receive some food samples for review purposes. All quotes are taken from the Target/Giada email or website. All thoughts and opinions are mine. Coleman Skinsmart Insect Repellant Deet Free Review and Giveaway! As you know we have started playing volleyball a lot in the evenings since we finally got our net up. (Not me of course, but the rest of the family.) Anyway, I sit out to watch. We are finding it best to play around dusk, but that is also mosquito time. I think mosquitoes love me! We can be sitting around a campfire when camping and I am always the first one to get attacked. My husband actually thought I was faking it one night because they don't bite him. My younger daughters also attract them. Now I hate to use products with DEET, so I was really excited to get a chance to try the Coleman Insect Repellent SkinSmart DEET Free! I received an aerosol can 6oz., a spray bottle 5 oz., and a package of 16 pre-moistened wipes. Each of these will work for up to 8 hours. That works for me, because I am seldom exposed to mosquitoes that long! So, I tried it the other night while everyone was playing volleyball and it works. Obviously do not allow a child to apply it to themselves, always have an adult do this. And do not apply to a child under 1 year old. I do have to tell you, the spray does not leave you feeling oily, it dries quickly and it's odorless. SkinSmart is said to protect against the most common biting insects including mosquitoes, deer ticks and biting flies. Do not use the sprays around the face. The wipes are perfect for this! As usual follow all directions! The active ingredient in SkinSmart is IR3535 and is an EPA registered additive with a proven track record of excellent safety and efficacy against a variety of biting insects. It is the most widely utilized active ingredient in insect repellents throughout Europe, where it has been safely marketed for more than 20 years. "The Coleman® Company, Inc. has been encouraging people to get outdoors. They've been doing so by developing rugged, reliable outdoor products that make being outside that much more enjoyable. From the legendary Coleman® lanterns and stoves, to tents, sleeping bags, coolers, backpacks, and grills. You name it, if there's something integral to a great outdoor experience, it probably has the Coleman® name on it. So when Coleman® decided to extend their brand into insect repellents, Wisconsin Pharmacal Company was the perfect partner. As a licensee, Wisconsin Pharmacal - a leader in the outdoor health and safety market - will use its longtime history as an insect repellent manufacturer to bring innovative, high quality repellents to the market under the Coleman® brand. A mutual love of the outdoors and dedication to helping people enjoy it to the fullest make Wisconsin Pharmacal and Coleman® a perfect fit. To learn more about Wisconsin Pharmacal Company, please visit www.pharmacalway.com." Now I like SkinSmart so much that I asked if we could do a giveaway with my neighbors At the Fence, and they said "Yes!". So one neighbor will receive exactly what I did. 1 Pump Spray, 1 Aerosol Spray, and 1 packet of wipes. Disclosure: I received no monetary compensation for this post. I received SkinSmart samples for this review. 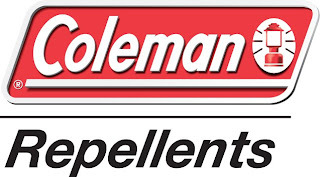 All quotes are taken from the Coleman Repellent website or email. All thoughts and opinions are mine. Cafe Press Laptop Skin Review and Giveaway! We have been having a great time here At the Fence, and there are so many super reviews and giveaways coming up! Let me share with you about two items I received from Cafe Press. The first is a magnet we chose for a pastor friend of ours. It is perfect for him. The magnet says "You Mess With Me..You Mess With The Whole Congregation." It has a silhouette of a church with people standing around outside. It would go great on our friends car, or maybe they will put it on their refrigerator. Who knows? Anyway, I hope we get to be there and give it to him, and not just mail it. The whole congregation will get a laugh out of it. The next item I received from Cafe Press was a laptop skin. This is something new there. I chose one with a bear and her 3 cubs, with a mountain in the background. I love it. It was reasonably easy to apply. I did have to peel part of it off more than once during the application because I kept slanting downward, but once on it looks great! I love it! The color and clarity of the picture are really nice. Cafe Press is a unique company to order from. They have so many choices, between t-shirts, laptop skins, magnets, mugs etc. and then you have to choose what you want on them.. There are pre-made phrases, pictures and sayings, or you can create your own. They even have flip flops! Most orders ship within 24 hours. Thus far I have never had a problem with anything from Cafe Press. And the great news is one neighbor At the Fence will win a laptop skin and get to choose from the many available. Mandatory Entry: Visit Cafe Press and look through their laptop skins and then leave a comment here telling me which one you would choose if you win. (If you win, you can change your mind.) You do not have to be a blogger, but you must leave a valid email where you can be reached should you win. This giveaway will end 9/12 at 11:59 pm CST. The winner will be chosen using random.org and will be notified by email. The winner will have 48 hours to respond. Disclosure: I received no monetary compensation for this post. I received a laptop skin and magnet for this review. All quotes are taken from the Cafe Press website or email. All thoughts and opinions are mine. I would like to share with you some of important tips I learned along the way regarding preparing for you new puppy. Start out with the right attitude and adjust as needed! Please be patient with your puppy and keep your sense of humor. The first few months will be busy and challenging as you and your puppy both learn to get along, but puppy-hood is only a short period in a dog’s life. The hard work you invest in your relationship now will reward you with a best friend for many years. some circumstances may require dogs to live outside, most dogs will thrive in an indoor environment. Your puppy should have a dedicated area of the house—such as a crate or bed—that he knows is his own. This is where your puppy will rest and sleep, and where he will feel safe and protected. Make it a warm and cozy place in a draft-free corner, in an area near family activity. Your puppy should be restricted from entering certain rooms in your home until he’s better trained and more reliable. Install a baby gate or keep the doors to those rooms closed at all times. Puppies get into everything! Safety-proof their environment. Preventing destructive and dangerous chewing is easier than trying to correct your puppy every second of the day. Look around the room from a puppy’s perspective for any items that would pose a choking threat: get down on your hands and knees and take a look at everything on the floor or in reach. Throw rugs, shoes, and misplaced items under a sofa or chair could all pose a threat to your puppy’s health. Look out for any loose or dangling wires and secure them properly. Remove any unsafe or breakable objects such as glass items, jewelry, and even pens with caps. furniture legs, woodwork, and other immovable items to prevent chewing. Thank you Ellen for an informative article. Everyone be sure to enter the Nu BowWow Puppy Starter giveaway here At the Fence. I Should Have Portable Solar Power! I bet you would never guess that I would have a hard time without internet and my cell phone! Since I have started At the Fence I seriously need to have an internet connection. There are times when we are traveling and I realize my laptop is dead and we won't actually be pulling in anywhere where I can plug in to recharge. What do I do? Usually I just have to wait. Would solar power be a solution? That is possible. I really don't like it when I can't at least type the post ahead of time, so it is ready to go up when we arrive, so I am thinking perhaps portable solar power would help. I also hate when we are separated from the children and my cell phone is dead. Here is how important my cell phone is for keeping in touch with my children. My two older daughters left for a trip with our pastor's family. They were going to a camp meeting for a few days. I think they were gone about an hour before I called to check in. They received 3-4 calls a day just to see how they were doing. Now for the big confession, they were 18 and 20. Isn't that horrible! They still laugh anytime we leave them to go on a trip because they know I will be calling shortly to see how they are doing. So, of course I need a way to keep my phone charged when we are traveling several days in a row. Now I guess you can see why I might consider portable solar power. I need to stay in touch! Disclaimer: I am participating in a Bucks2Blog campaign. I will be compensated for this post. All thoughts and opinions are completely mine. Would you like to hear about a really great all natural sausage made from chicken? I received three packages of al fresco All Natural Chicken Sausage. I fixed all three packs the same night because with 8 in the family, two of whom are teenage boys, well ... that should say it all! I received the Spinach Feta (with a hint of Rosemary), Sweet Apple (with pure Vermont Maple Syrup), and Sweet Italian Style (with red and green peppers). All al fresco Sausages are made with lean, skinless chicken meat. There are no artificial ingredients like MSG, nitrates, preservatives or nitrites. And they are gluten free! I cooked them all up together, and each person was able to choose what they wanted. The Sweet Apple was the favorite of the three. This would make a very good breakfast sausage, it is sweet. Next was the Spinach and Feta. My daughter actually said this was her favorite. And the last was the Sweet Italian. The younger children did not care for this one as much because of the stronger herb taste. They were all moist and cooked up great! They are fully cooked, so all you have to do is heat, serve and enjoy! My husband added cheese to his. The al fresco All Natural Chicken Sausage is a healthy alternative to other sausages. These would be great on the grill! And they have a recipe page you can check out for more ideas! "al fresco. It’s all about fresh flavor from fresh ingredients. Our mission is to provide delicious all natural products that are easy to prepare as part of a healthy lifestyle - live life with flavor. Executive chef, Susanna Tolini revels in introducing our customers to a whole new way to enjoy chicken sausage- from scrumptious unexpected flavors such as Roasted Pepper & Asiago and Spinach & Feta to great, easy recipe ideas for all of our 14 al fresco gourmet flavors. Our roots are grounded in over 100 years of quality sausage making. Al fresco’s founder, Deb O’Donnell is the granddaughter of Kazimierz Monkiewicz who in 1909 sold his handmade sausage out of a horse drawn wagon and started Kayem Foods. Kayem is now a premier manufacturer of some of the country’s leading brands of meats including al fresco. While studying for her MBA, Deb saw a need that wasn’t being met amongst her fellow female classmates - a delicious tasting sausage that was also good for you. Hence the light bulb that is al fresco was lit and armed with her sausage making heritage and savvy grasp of customer needs, Deb started developing recipes for an all natural, delicious and healthy chicken sausage. al fresco is now the #1 chicken sausage brand in the U.S. We offer our all natural chicken sausage in dinner and breakfast varieties. All of our products have 70% less fat than pork sausage and are free of nitrites, nitrates, preservatives and artificial ingredients, but full of flavor. Just as Deb’s idea for al fresco came from listening to her classmates, we continue to listen to our customers every day. We’d LOVE to hear from you. Be it a new flavor idea, a recipe, a compliment or healthy criticism, we want to hear it all so that we can continually surprise and delight you, our customers. " So neighbors make sure you check out the al fresco website and see if they have a flavor you would like to try. You can also find them on Facebook. Disclaimer:I received no monetary compensation for this post. I did receive al fresco All Natural Chicken Sausage for review purposes. All quotes are taken from the al fresco website. All thoughts and opinions are mine. Have any of you ever tried TracFone? We presently have 5 cell phones on our present plan with our cell phone company. Mainly because we travel so much and sometimes go in separate directions. We need to keep in touch. The youngest who has a phone will be 18 the end of this month, so don't get too concerned. Anyway, we have recently been wondering if there is a way to lower our phone bills, since we really only use all 5 phones when we are on the road. Guess what? I think TracFone could help. I am also including some real TracFone customers telling you about their TracFone experience. There are so many features that make owning a TracFone a benefit. From lowering your cell phone bill, to less dropped calls, to nationwide coverage and more. TracFone is the only wireless service where you can call internationally for the same price as any other call. You can get "Double minutes for the life of your phone" for only $19.99 but some phones include it! My neighbors should check out TracFone if they are looking for a way to lower phone bills. Maybe TracFone can help you. If you already use TracFone leave a comment and tell me about your experience. Taking a break from moving the younger girl's bunkbed to our back patio. We finished painting and finally were able to move the beds in. They are now redecorating to their hearts content. They want Webster our new Sheltie pup to sleep out there with them. He probably will since he is doing so good on his house-training. He is one of the easiest dogs we have ever had regarding house-training. I wanted to share with you for a minute about Hill's Healthy Mobility Challenge. There are 3 steps to taking the challenge. First you need to register. 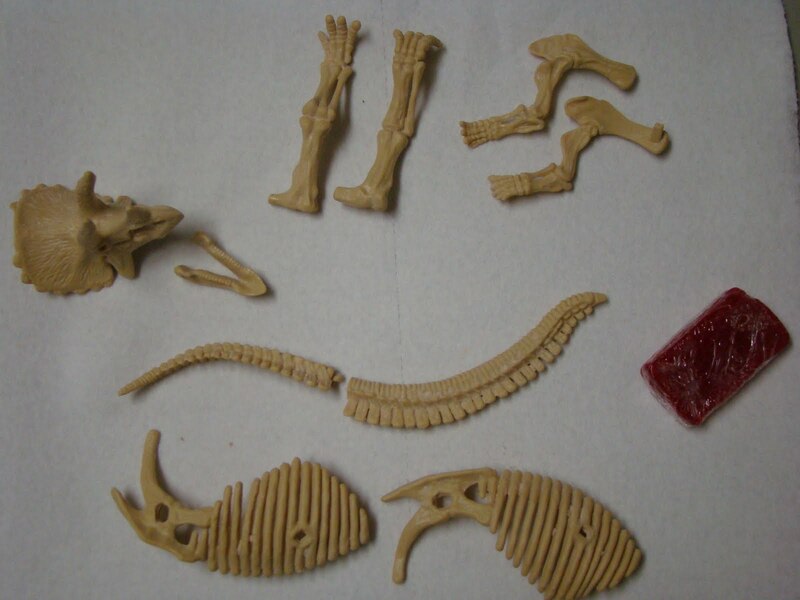 Next start feeding your dog Science Diet Healthy Mobility Dog Food, then share your success. Track your dog's progress over 30 days and then visit the site and share your story. By registering you will receive $30 in Hill's Healthy Mobility Coupon, and automatically be entered in their Sweepstakes where 30 winners will receive free pet food for a year. Now, that sounds great to me! Make sure to check out the site for yourself. Visit the Hill's Science Diet website where you will learn more about Hill's Pet Nutrition. I will be checking them out myself, as I have heard alot of positive information regarding Hill's Science Diet and I wouldn't mind trying it. If you use Hill's Science Diet leave a comment here letting me know how you like it. I would love to hear your opinion. You can also find Hill's Pet Nutrition on Facebook. I have a feeling Webster would like it, although he seems to eat anything that can't get away from him first. We found him with the lid off the treat jar helping himself after one of the children left it sitting on the floor. He looked quite satisfied with himself. Also if you need him to come, like when he is hiding under our bed... just make a crinkle a bag of snacks and he comes running. Here is another review from Educational Insights. 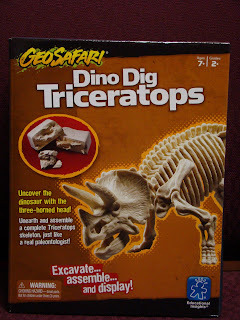 The Dino Dig Triceratops! This is a great item! This kit includes a Triceratops skeleton fossilized in a clay block, tools for you to excavate, wax adhesive to put the bones together, a stand to model your dinosaur on, and a guide book. First you get your excavation tools and dig the fossils out of the clay. This took a long time. 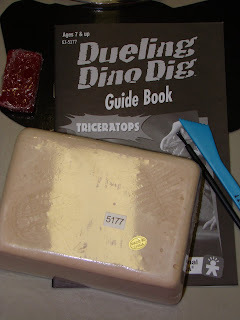 Then you use the wax adhesive to put the bones together and placet him on the modeling stand or pose him with other dinosaurs or models. 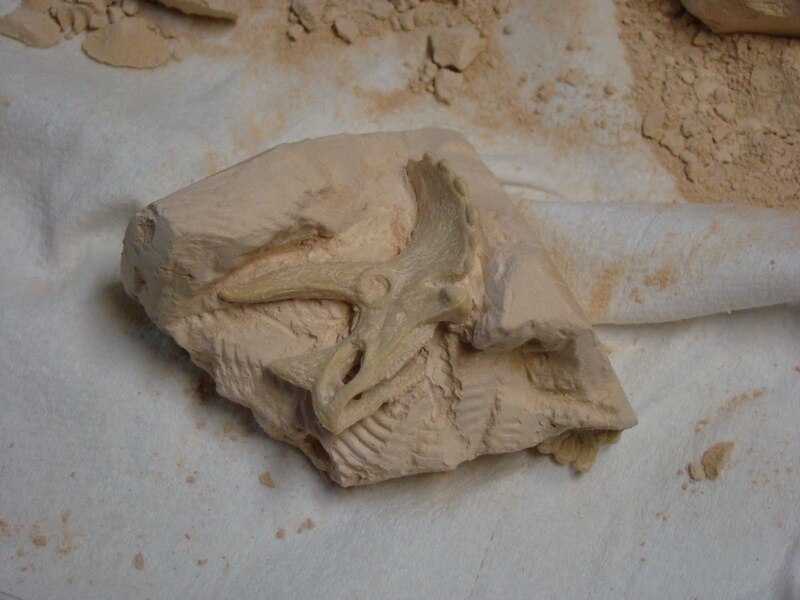 We had alot of fun digging out this dino! Above - If you get the clay a little wet you can dig easier. Above - Here we are digging out a leg! (Here is one of the rib cages we dug out. 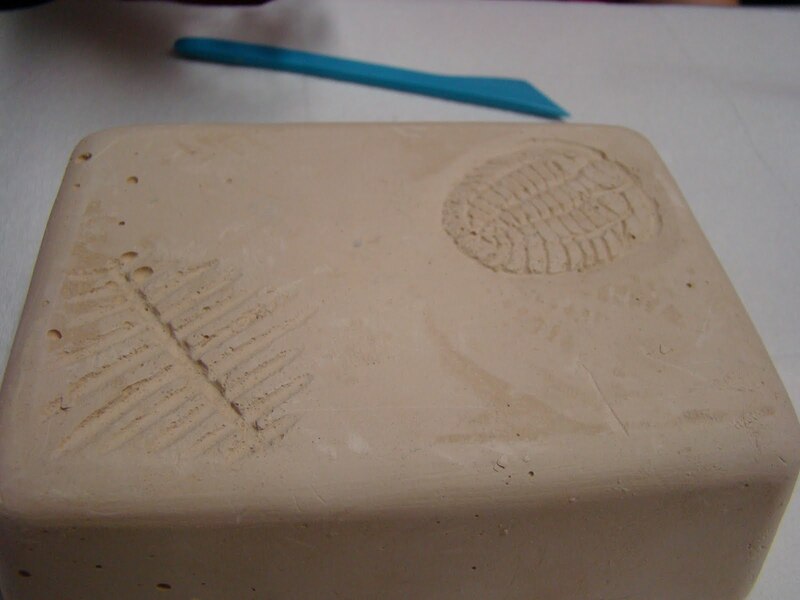 Above - The marks on the clay are hints of where bones are. Above - We found the head!! 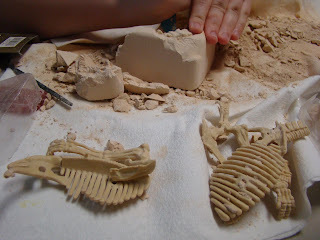 Above - Here we are getting ready to piece together the Triceratops. 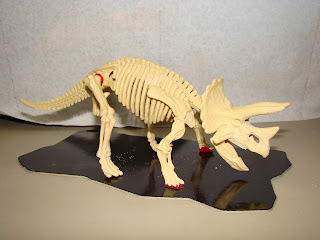 Above - Here is the finished Triceratops! Once again another great product from Educational Insights. We really loved it! 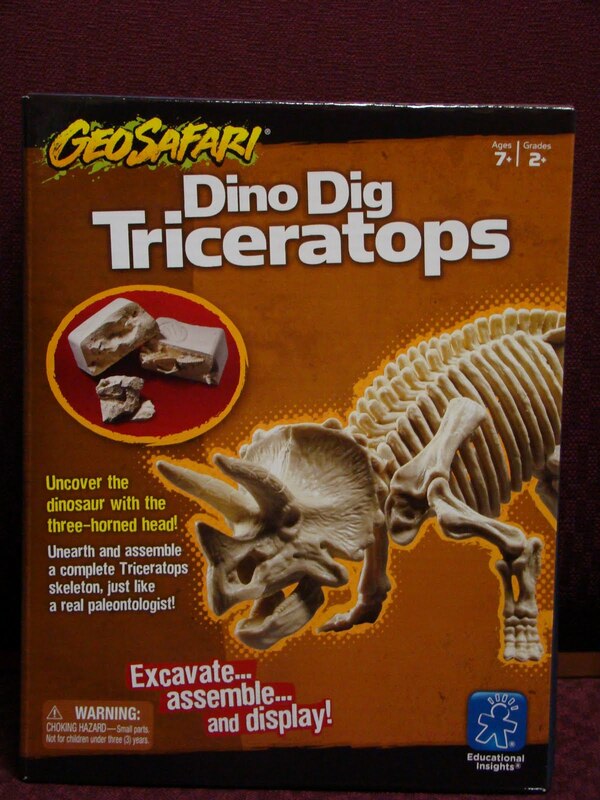 One neighbor will win a Dino Dig Triceratops. Disclosure: I received no monetary compensation for this post. 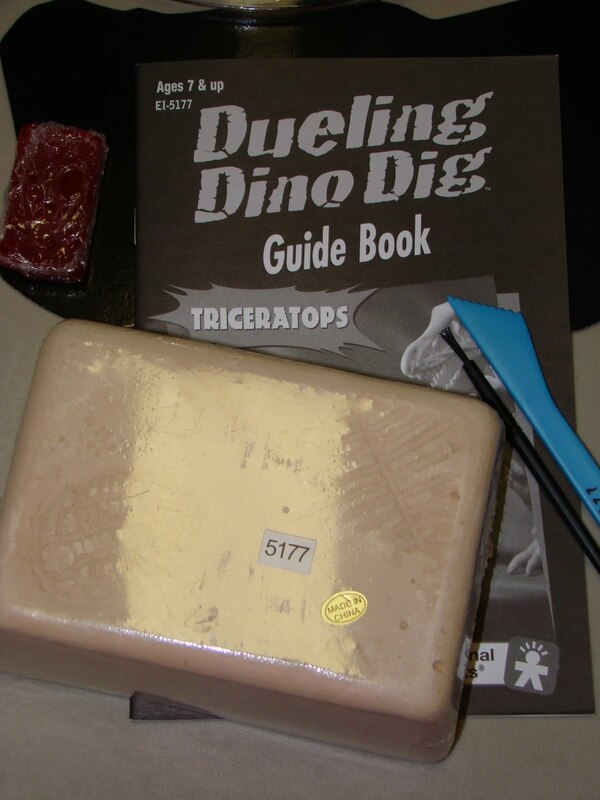 I received the Dino Dig Triceratops game for this review. All quotes are taken from the Educational Insight website or email. All thoughts and opinions are mine. I have been having a really great week! Still going to the gym and doing the treadmill 3 times a week, still dieting and losing weight (Yeah! ), finished moving the room and getting ready for school again! Webster (new puppy) is doing really well on house-training, and summer will be coming to an end soon and I can enjoy my favorite season...FALL! Anyway, here is a really, really neat company! It is called Kidlandia! You can designed personalized products here. My daughter was able to go on their site and design a placemat and a poster. She did the Hundred Acre Wood. We enjoy the old Winnie the Pooh book, so she was able to design her own little world in the Hundred Acre Woods on a placemat. You or your child are able to go on the site and name different places with the names of people in your family, relatives and friends. It really is a neat idea! She really had a lot of fun doing this! Then we were able to also get a poster of the US (called Whimsical USA Map) where she was able to add animals, cabins, trees, etc. And she was able to name places! She made her birthday a national holiday, and created her own city. Talk about an ego! Seriously, this would be fun to allow your child to design, like M___ did. Or you could design one for your child as a surprise. There are several different choices for designs at Kidlandia. Some are based on characters and still others just fun places to design. You have a choice of placemats, posters, mug, pillowcase, blanket, growth chart, etc. "The founder of Kidlandia, illustrator and entrepreneur Brian Backus, has been living in a fantasy world of maps and monsters since he was a very little boy. Kidlandia grew out of Brian’s 2004 concept to create personalized maps of imaginary kingdoms for children’s rooms. He believed that by providing children their own kingdoms, with friendly monsters as companions, kids would gain an increased sense of confidence, control, and self-worth. 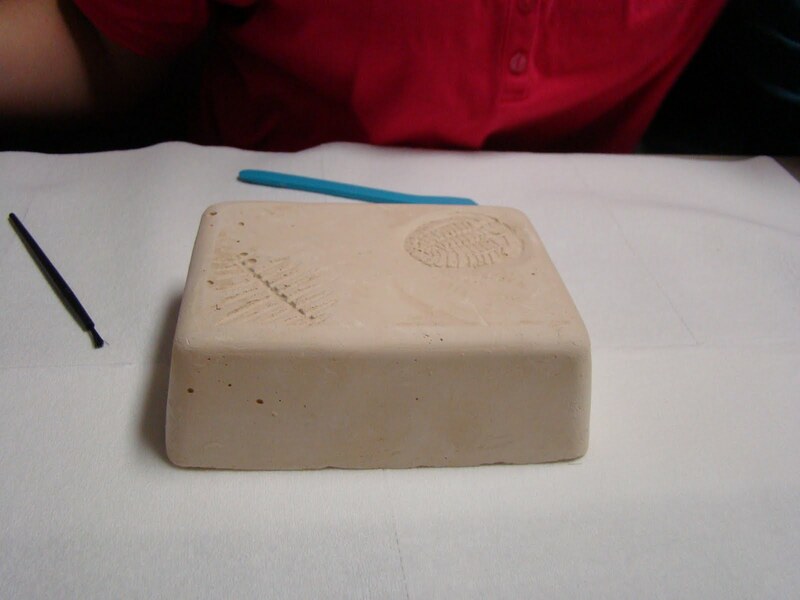 In addition, by naming the cities, islands, and other features of the kingdoms after family and friends, kids would feel more connected to those who love them. Brian, who produced educational multimedia titles for Disney and Voyager, was also intrigued by the idea that by engaging kids in namesake kingdoms, he could motivate them to understand maps, and accelerate reading skills. Although the maps cost up to $2,000 and were only sold by word of mouth, Brian could not keep up with demand. He received consistent feedback that the maps were among the favorite gifts of a lifetime. In response to this encouragement, he determined to make the maps more widely available, and at affordable prices. Kidlandia was born. Today, Kidlandia is comprised of a team of talented engineers, designers, and business professionals. Kidlandian team members share a passion to bring delight and meaning to the lives of children and their families. 2.5% of Kidlandia’s founding stock has been set aside as the basis for a future charitable Foundation benefiting children. " So I encourage my neighbors to take a minute and check out Kidlandia's website. If you decide to order, use MomBlog20 for a 20% discount. Disclosure:I received no monetary compensation for this review. I did receive a placemat and poster for review purposes. All quotes are taken from the Kidlandia website or email. All thoughts and opinions are mine. Nonni's Biscotti Bites Review and Giveaway! Big Apple Pet Supply Super Giveaway! Math Slam Review and Giveaway! Letter Learning Review and Giveaway! Accent Studios Review and Giveaway! Elle Naturals Lip Balm Review and Giveaway! Carmex Summer Fun Review and Giveaway! Nu BowWow Puppy Starter Kit Review and Giveaway! Become Body Scrub Review and Giveaway! 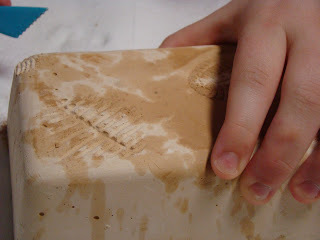 Robby Wash Ball Review and Giveaway! Fiber One 80 Calories Review and Giveaway! Sans Sucre Review and Giveaway!